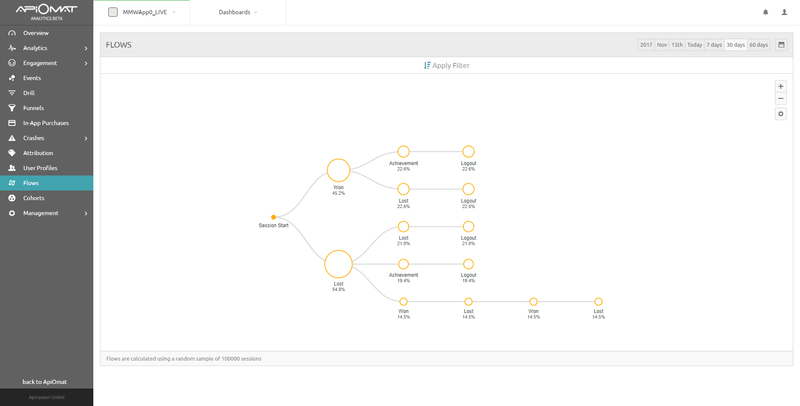 Funnels and Flows tools to analyze in-app events. These can be create retroactively and offer insights into user behavior. Funnels are ordered collections of events which helps you see how users flow through your mobile or web application based on the your app's custom events. This helps you track various goal completion rates that all based on your app's events meaning you can easily add new events if you want to add layers to your funnel. 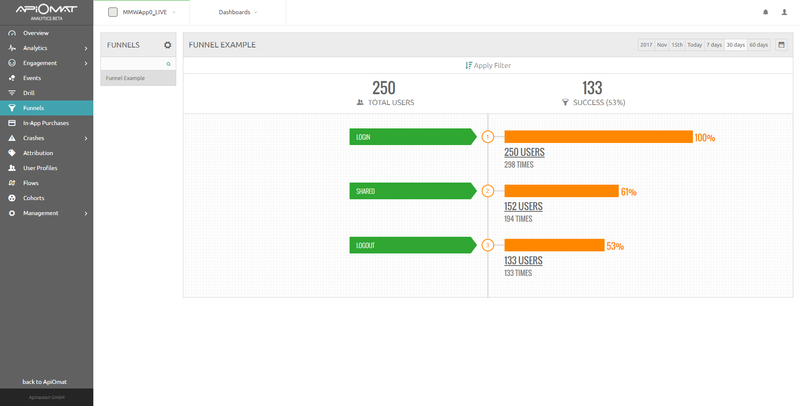 To create a new funnel, click on the gear symbol next to Funnels and select the order of events that you want to track. Once you're done, you will see results similar to the image below. As with all data in ApiOmat Analytics, you can apply filters here to view how various users on specific devices are interacting with your application. So if your Android app is performing poorly in comparison to your iOS app, you can identify any potential bottle necks to find out where the user experience may needs improvement. As your app becomes more complex or you decide there is additional events that are relevant for your funnel, you can edit your funnels and add additional events to it. The data used in Funnels is retroactive, meaning you can create a new funnel to analyze information that happened in the previous month. To help you understand user sessions, flows visually display the various order in which a user completes in-app events. Flows use the information collected from custom events and lets you see how many users follow a specific pattern. You can segment the flows with various options such as device, country, platform or campaign. By clicking on the circles you collapse the view, hiding any following events. You can also adjust the maximum number of steps and the number of nodes per step shown by clicking on the settings gear on the right-hand side of the flows chart. Flows are calculated using a random sample of up to 100,000 samples from the filters and time frame that you select.